On this date in our family history . . . the 27th day of June . . . in the year 1885 . . . Mahala Lee Sharp Hall nee Roberts dies on the Hall Plantation in Houston County, Texas . . . this Mahala is a 3rd great-grandma of the Keeper of this family history blog. . . .
Mahala Lee Roberts was born in Washington Parish, Louisiana on 3rd November 1816, the 7th of nine children born to Elisha Roberts (1774-1844) and Martha "Patsy" Gill (1781-1845), who had moved from Kentucky to Louisiana ca. 1811. 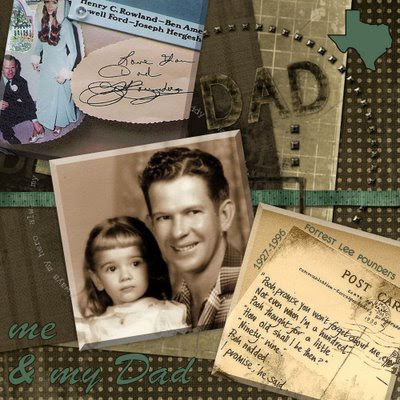 By the time Mahala was 10 years of age her family was living in the Ayish Bayou area of Coahuila y Tejas, where Mahala would grow up in a house that fronted on the public highway (El Camino Real / King's Highway) coming into Texas. The Elisha Roberts home was frequented by many overland travelers, and while known far and wide for its hospitality, there is also a record of a murder or two on Elisha's property -- ca. 1826 or 1827 -- when a Matthias Yokum and his brother-in-law, James Collier, were killed by a man reported to be named Charles Chandler. During Mahala's teenage years, her father was elected as Alcalde of Ayish Bayou (1831), as well as being a delegate to the 1833 convention at San Felipe de Austin. During the Texas Revolution, this household furnished provisions, lodging and transportation for the revolutionary cause. Mahala was 19 years old at the time of the Battle of the Alamo (1836), and when Gen. Sam Houston was wounded at the Battle of San Jacinto shortly thereafter, he spent a part of his recovery period in the household of our Elisha. On 22nd March 1838, a 21-year-old Mahala became the wife of John M. Sharp (age & further info unknown at this time). Their son -- Samuel Houston Sharp (1839-1885) -- was born the following year, followed by a daughter in 1840, and sometime after that birth, our John M. Sharp disappears from all records we have been able to research. In 1844, Mahala's father dies, followed by the death of her sister, Elizabeth, in May of 1845, and then her Mother, Patsy, the following December -- just 9 days before Texas is annexed as the 28th state of the Union. In 1846, Mahala is listed on the tax list for San Augustine County, indicating she is head-of-household. In 1847 her sister, Anna, dies in Austin County. On the 1850 Census for San Augustine County, Mahala is enumerated as living next door to Lt. Governor John A. Greer. In February of 1851, Mahala marries a much older Joshua James Hall, and they set up housekeeping on the Hall Plantation in Houston County, Texas. Mahala's life between 1860 and 1866 is documented on a sometimes daily basis in the Civil War-era journal of her stepson and son-in-law, James Madison Hall (1819-1866), who had married Mahala and John's daughter, Margaret Sharp, in 1859. Mahala's son and my 2nd great-grandpa, Sam, marries Mary Alexandrien Lemaire in 1861, who dies in 1876. Mahala's 2nd husband dies sometime after the 1870 census, and her daughter, Margaret, dies ca. 1878. Mahala is enumerated as the head-of-household on the Hall Plantation at the time of the 1880 census. Other family members in the household are her widowed son, Sam, and his 6 surviving children, including my great-grandma, Berta Mary (1873-1955). It is said that Sam as well as his youngest daughter, Willie, died ca. 1885, which is the same year Mahala died. The deceased family members listed in the last two paragraphs are buried in the Hall Cemetery in Houston County, Texas, which has been designated by the State of Texas as an official historical cemetery. FYI . . . 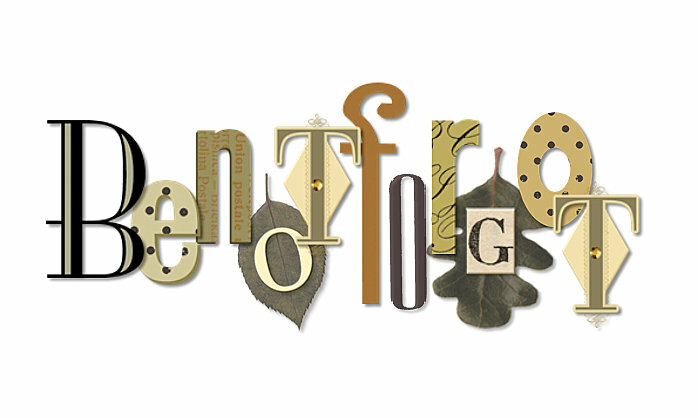 I created the collage image of our Mahala by starting with a background paper designed by Robyn Gough. 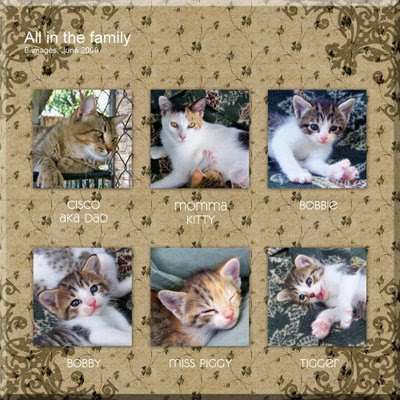 I then used Picasa to select that backround page, plus Mahala's photo, plus a brown backer for the photo, and created a new image using the collage feature. 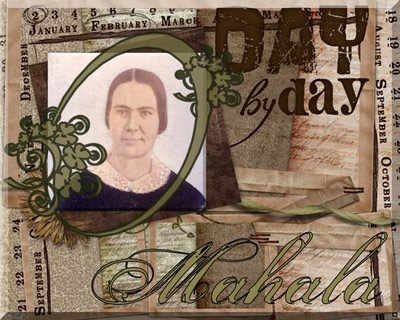 I then used Picasa to add Mahala's name as well as the floral frame (dingbat font) around Mahala's face. On this date in 1930 . . . the 23rd day of June . 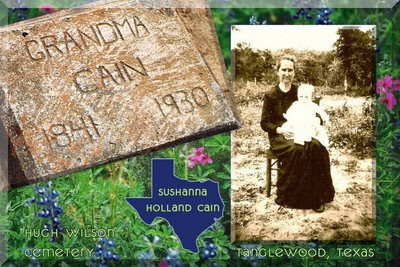 . . Grandma Cain died in Tanglewood, Lee County, Texas . . . aka Susan / Susanna / Sushannah Cain nee Holland . . . she was born 08 December 1841 in Franklin County, Alabama . 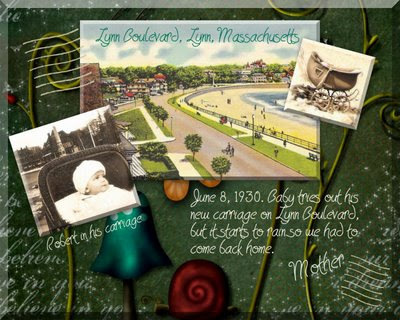 . . and she is a 2nd great-grandma to the Keeper of this family history blog . . . the burial location of Grandma Cain is marked with a simple homemade tombstone, which is shown on the left in the photo collage . . . on the right is Grandma Cain holding her great-grandson, James Oscar Beard (1918-1980) . . .
Rockdale Reporter. Thursday, July 10, 1930. Rural News. Cole Springs. Grandma Cain passed away last Monday evening. She had been helpless and bed-ridden since last October. She was ready and anxious to take her departure. She knew in whom she believed, and she was not afraid to die. "Precious in the sight of the Lord is the death of His saints." Mrs. Cain was a native of Alabama. She was 88 years old the 8th of last December. She leaves one daughter, Mrs. J.M. Pounder of Tanglewood, and a host of grandchildren and great grandchildren to mourn her departure. Texas Death Certificate. "Deceased was not attended by a Physician during her last sickness. Cause of Death from statements was dysentary. Dislocated hip from which she was confined to sick bed until her death." "I.C. Shaffer, M.D., . . . am of the opinion that her ailments were results of dislocated hip in October 1929, & the immediate cause of her death was dysintiry." I still have quite a few questions about this Sushannah. The genealogy info passed on to me by numerous family members said that Sushannah was married to Isaac Cosby Cain and that they had two children -- Thomas Sylvester Cain (1862-1920) and my great-grandma, Mary Susan Pounders nee Cain (1873-1950). 1900 :: have not been able to locate Sushannah . . . she is NOT enumerated in Texas with either of her children and not enumerated in Alabama with her widowed mother or with any of her sisters . . . but family tradition says she came to Texas with her married daughter ca. 1896 . . .
Susanna Cain's "Widow's Application for Confederate Pension" was dated 06 June 1930, less than two weeks before she died after being bedridden since October of 1929. In a cover letter (from the County Judge) which accompanied the application, W.F. Schlosshan observed that, ". . . she (Susannah) is very old ~ more than 88 years, and she was not able to furnish all the information in her application. . . ."
In said application it is alleged that Susannah stated that she was married to Isaac Cosby CAIN in 1858 in Franklin County, Alabama. It is also alleged that Susannah stated that her husband had died in 1865 in Alabama. In another part of the same application, it is stated that Isaac CAIN ". . . may have died before being discharged." Online I found the following . . . Cain Isaack Company I Regiment 42 AL Hospital No.3 DOD 3/28/1863 Grave #951 . . . this Isaack Cain was buried in Vicksburg following his death during the time of the Vicksburg Campaign . . . HOWEVER . . . IF this is Susannah's husband, "their" daughter, Mary Susan (CAIN) Pounders, was allegedly born 30 September 1873 in Franklin County, Alabama . . . about eight years after this Isaac is said to have died . . . and more than ten years after the death of the "Isaack Cain" at Vicksburg . . . I found Mary Susan on every census record beginning in 1880 . . . and they all support the ca. 1873 date of birth . . .
A letter dated 24 May 1930 from the War Department in Washington stated the following . . . "the records show that one Isaac Cain enlisted August 10, 1862, at Columbus, as private of Company I, 42d Alabama Infantry, C.S.A. . . . The company muster roll for September and October, 1862, . . . reports him absent, taken prisoner and paroled October 5, 1862 . . . another records shows that he was paroled at Bolivar, Tennessee, October 13, 1862 . . . no later record of him has been found. . . ."
Susannah's pension application was approved . . . on a husband that supposedly died during the war (1861-1865) . . . but it appears that the only payment that may have been made would have been after her death . . . when one of her grandsons made an Application for Mortuary Warrant. . . .
Old Rockdale postcard . . . 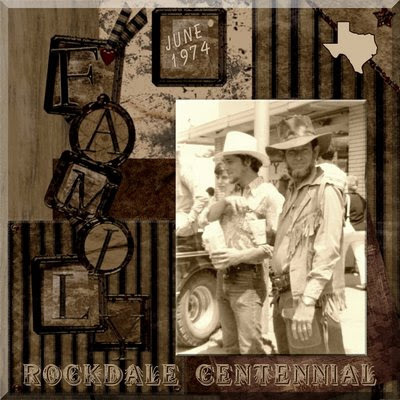 The postcard in the collage has been reproduced in multiple Rockdale publications . . . location / ownership / existence of original unknown . . . According to a newspaper clipping from the files of my cousin, Peggy, a Henry family reunion was held at the old Hamilton homeplace in Rockdale, Milam County, Texas sometime in 1931. 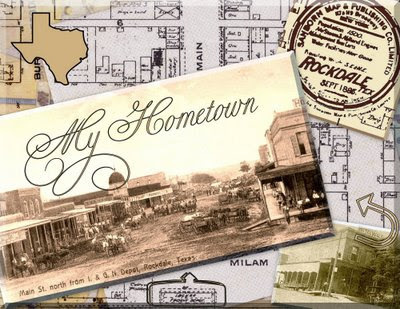 That yellowed and crumbling piece of paper recorded the following about the arrival of my 2nd great-grandpa, William Paschal Henry (1836-1912), and his family in the brand-new town of Rockdale, Milam County, Texas . . .
On Oct. 3, 1876, the Henrys arrived in Rockdale to visit a sister and family of Mrs. Henry's, it being Dr. and Mrs. M. F. Anthony, who at that time had the post office and drug store combined on the corner where the Wolf Hotel now stands. 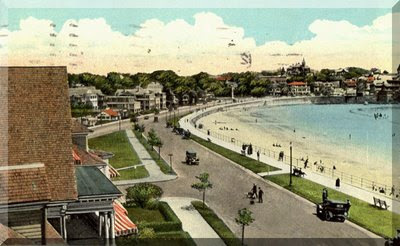 That is the Hotel Wolf in the lower right corner of the above collage, with an arrow pointing to the same building on the old Rockdale postcard. 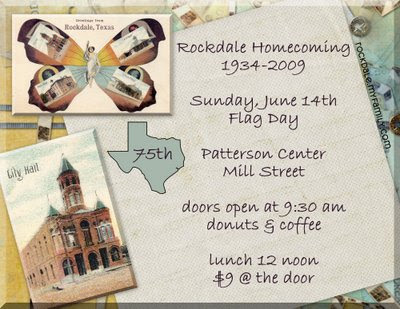 The Hotel had gone out of business before 1935 when Rockdale's American Legion post purchased the building. When I was in high school (the 60's), we frequently spent a portion of our weekend hours attending teen dances -- with real live bands! -- in the un-airconditioned bottom-half of this building. My parents were regular fixtures as chaperones at these events. Directly across the street was McVoy's Grocery Store where my parents shopped weekly. Every Friday, my widowed Grandma, who never learned to drive, had her grocery list ready for Mom or Dad to take with them to McVoy's. There was a large wooden magazine rack near the front door where I would sit and read comic books while Mom checked out. Mr. Galbreath kept the produce stocked and freshly washed, and would give us pieces of fresh sugar cane to chew on. The meat market at McVoy's was where Mom bought steak cutlets for making her infamous chicken-fried steak with cream gravy which NONE of us have ever been able to replicate. 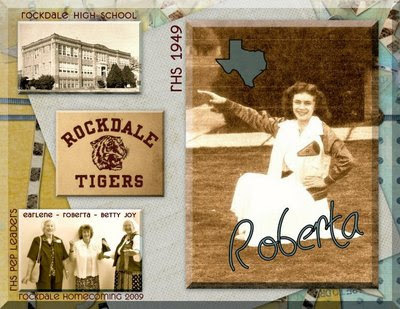 I was back on Main Street just this past weekend while in Rockdale for the 75th Annual Rockdale Homecoming as well as my Mom's 60th RHS Class Reunion, where I was flattered to be told by numerous people (who had known Mom since the 40s) that, "You look just like your Mom!" At the Homecoming gathering, one lady said to me, "Aren't you the one who found the snake in the bedroom when you were babysitting Delaine?" That was also during high school in the 60s! I was babysitting for the local pharmacist in his home. The baby and I were sitting in the rocker / recliner in her nursery when I saw a snake come crawling in the room! I got out of the room with Delaine and shut the door (which wasn't much of a barrier since it had such a gap at the bottom) and called my trusty Dad at our home (no cell phones in those days). Dad was there immediately, but it took him a while to find and kill the poisonous copperhead -- it had crawled up into the coils under the rocker / recliner! Before I left town, we (me & Mom & my sister) visited the Dan Kubiak exhibit at the I&GN Depot, and I also took a few photos of Joy Graham's Bit of History building on Cameron Avenue. The journey back home to Main Street was nostalgic, while somehow filled with the sweet assurance that at Home we are not forgotten. These people knew me as a child. They knew my grandparents. And in some cases, their parents and grandparents knew my ancestors. 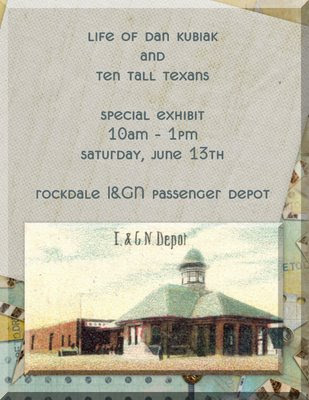 And many of the families of Rockdale have somehow managed to climb into my family tree! 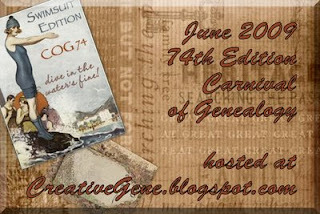 This 19th of June 2009 blogpost was prepared for Evelyn Yvonne Theriault's June edition of the Festival of Postcards . . . and was also submitted for Postcard Friendship Friday which was formerly hosted by Marie Reed. My Mom is the adorable little girl in the photo above on the top right. The little boy running away from the camera is her older brother, Robert E. Henry, Jr. (1930-1997). The good-looking couple in the middle-left photo is my grandparents -- Robert E. Henry, Sr. (1905-1976) and his first wife, Elizabeth Marilla Henry nee Smith (1912-1932). Robert Henry was born in Milam County, Texas in 1905, and had been working as a cowboy in West Texas before travelling to Dallas, Texas in 1927 and enlisting in the United States Navy. It is highly doubtful that he had ever seen the ocean before making that drastic change in his lifestyle. While in the Navy, he met and married the 17-year-old Maine beauty who was to become my maternal grandma -- Elizabeth Marilla Smith. They married in July of 1929. Their son was born in May of 1930. Robert was discharged from the Navy in January of 1931. Mom was born in January of 1932. And Elizabeth died 3 days later. 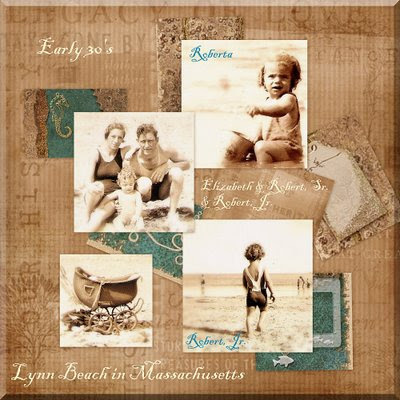 Based on the photos we are blessed to have in our family, it would seem that they must have spent a large portion of their very brief time together playing on the sandy beaches of Lynn, Massachusetts, as well as at Lake Winnipesaukee in New Hampshire. One of the tidbits of information that was passed to my Mom about her mother was that Elizabeth was a talented swimmer, and loved the water. This blogpost created for the . . . Which of your ancestors were alive in 1909? Where your ancestral families were living in 1909. What country, state, county, city/town, etc. Who was in the family at the time? Use the 1910 census as "close enough." On the 6th day of June in the year 1909 . . . on my Dad's side of the family . . .
His father, Jacob Edmund Forrest POUNDERS (1902-1957) -- who is one of twelve children -- is a month shy of his 7th birthday and living in Manor, Travis County, Texas with his parents, James Madison POUNDERS (1867-1942) and Mary Susan [CAIN?] POUNDERS (1873-1950). Also in the house in 1909 would have been these siblings -- Zula Rodoski (1889-1968), Margaret Darthula (1891-1963), James Thomas Luther (1893-1984), William Rufus Oscar (1895-1979), Anna Virilla (1896-1978), Minnie Ruth Estelle (1899-1976), Fannie Myrtle Lee (1904-1947) and Everett Franklin (1908-1910). Bernice (1913-1999) and Freddie Benjamin (1916-1987) came along later. The widowed mother of James Madison POUNDERS -- Nancy Virilla (QUINN) POUNDERS (1847-1930) -- is living in Franklin County, Alabama, with her married daughter, Annie (POUNDERS) GRISSOM and her husband, John Wesley, and three of their children -- Luther Wesley, Rutha and Eva. And while I have not been able to find the widowed mother of Mary Susan (CAIN?) POUNDERS on the 1910 Census, it is said that Susanna (HOLLAND) CAIN came to Texas ca. 1896 with her daughter and family and lived with them until her death in Texas in 1930. In 1909, Dad's mother -- Ima Lois (MUSTON) POUNDERS -- is only 3 years old and would have been living with her parents, Charley MUSTON (1882-1815) and Emma Patience (NETTLES) MUSTON (1882-1964), in Lee County, Texas. Ima is the 2nd of seven children -- all girls -- Erma Audrey (1904-1991), Ima Lois (1906-1999), Mollie Gertrude (1907-2002), Stella May (1909-2001), Nona Amy (1911-2002), Gladys Coreen (1913-2007), and Pauline Lucille (1915-2004). Charley's widowed father, William Alexander MUSTON (1854-1936), is living with his son in Lee County, Texas. Emma's widowed mother, Mary Annie (WEST) NETTLES (1852-1939), is also living in Lee County in 1909 -- with her unmarried son, William Edward Nettles (1874-1947). On the 6th day of June in the year 1909 . . . on my Mom's side of the family . . . Her father, Robert E. HENRY (1905-1976), is living with his parents -- Edgar HENRY (1872-1950) and Berta Mary (SHARP) HENRY (1873-1955) just north of Rockdale in Milam County, Texas. Siblings in the household in 1909 would have included Rubie May (1895-1978), George Rettig (1897-1977), Frank (1899-1952), Milton Edgar (1902-1975), and Oscar Lee (1907-1981). Another brother will be born, and die, on 16 Sept 1909, followed by one more sister, Nellie Josephine, in 1912. 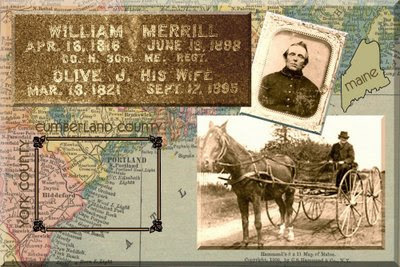 Edgar's widowed father, William Paschal HENRY (1836-1912) is living with his son in Milam County. Berta's parents and grandparents are all dead by long before 1909. Mom's Mother -- Elizabeth Marilla (SMITH) HENRY (1912-1932) -- is not on the scene yet, but Elizabeth's parents -- Thomas Warren Alonzo SMITH (1866-1920) and Eva May BRACKETT (1874-1936) -- are living at 43 Prospect Street in Biddeford, Maine, where they operate a florist and landscaping business. They have one child in 1909 -- Thomas, Jr. (1904-1959). Thomas' parents are both dead by 1909, but Eva's adoptive parents -- Peter BRACKETT (1838-1927) and Elizabeth J. (MERRILL) BRACKETT (1841-1911) -- are renting at 74 Beach Street in Saco, Maine, while her birth mother -- Phoebe (MERRILL) MORSE TRIPP (1848-bef. 1930) -- is living in Gorham, Maine with another married daughter. The birth father will probably never be known. *It does seem that Randy and I both descend from the same Aquila CHASE (1618-1670) and Anne WHEELER (1627-1687) -- Randy via their son, Thomas (1654-1733), and his wife, Rebecca Follansbee -- and me via their son, Aquila (1652-1720), and his wife, Esther BOND, whose daughter, Esther (1674-1751) married Daniel MERRILL (1670-1725), and they are 4th great-grandparents of the Phoebe MERRILL mentioned above, who is one of my 2nd great-grandmas.